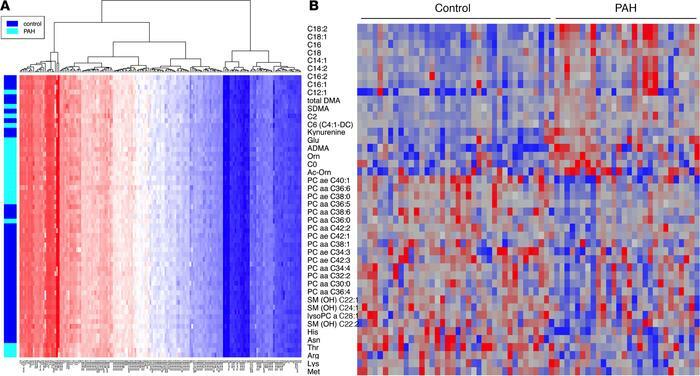 Heatmap of 169 metabolites associated with lipid metabolism separates PAH from controls. (A) Metabolomic cluster analysis of lipid metabolites shows that plasma lipids broadly separates PAH from controls. (B) We examined the entire metabolomics data set for differential expression between PAH and control and found that 44 were different at P < 0.05 (uncorrected) by unpaired 2-tailed t test (FDR = 9.4, 21%). Heatmap of these differentially expressed metabolites reveals that PAH exhibits overrepresentation of lipid metabolites compared with glucose-related metabolites. n = 25 PAH, 26 controls.